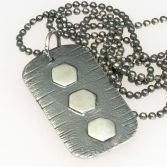 My unique Textured Dog Tag pendant is made of solid sterling silver and has three raised hexagon shaped detail down the front and is textured to other areas. 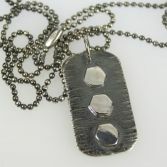 The images show the Textured Dog Tag Pendant with an oxidised blue black finish to some area to give it a contemporary look. The Textured Dog Tag pendant can be supplied with a bright silver finish to all areas if required, just select this finish using the drop down option below. 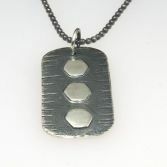 The pendant measures 38.0 mm x 20.0mm and is made of solid sterling silver 1.2mm thick. 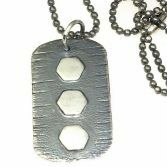 It is hung on a strong military style 2.0 mm sterling silver ball chain which is 24 inches long also available in bright silver finish if you select this option. Your pendant has been fully hallmarked at the Edinburgh Assay Office and all my sterling silver is sourced from a reputable UK bullion dealer. 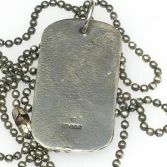 Your Textured Dog Tag pendant will be presented in one of my signature gift boxes and posted via Royal Mail 1st class delivery (signed for) to any address in the UK free of charge.